Parsley at Sherrill Farm Holiday Cottages in Dunterton, near Tavistock, Devon sleeps 4 people. Sherrill Farm Holiday Cottages is a complex of 13 delightful self-catering cottages, converted from the original 300 year old barns and farmhouse set within 16 acres of Devon farmland. Clustered around the central courtyard, the properties (refs UKC1438, UKC1428 [Sage], UKC1429 [Dill], UKC1430 [Oregano], UKC1431 [Tarragon], UKC1432 [Fennel], UKC1433 [Great Meadow], UKC1434 [Coriander], UKC1435 [Elderberry House], UKC1436 [Chestnut House], UKC1437 [Rosemary]) retain many original features and are charmingly furnished and decorated, with well-equipped kitchens. Located near Dartmoor and midway between Tavistock and Launceston on the Devon/Cornwall border, in wonderful rolling countryside. The historic market town of Tavistock is just 6 miles away and is a popular town with indoor pannier market and local shops selling locally produced foods. Horse riding is also available locally, as is trout fishing. Why not try canoeing on the River Tamar, or perhaps cycling on the Plym Valley track? The north and south coasts of both Devon and Cornwall are within easy reach by car and offer an amazing choice of splendid sandy beaches, a variety of water sports, cliff top walks, swimming, surfing and other seaside activities. The owners can also recommend local caterers, and guests can contact Lifton Farm Shop to organise a hog roast. There is a beach 20 miles, with the shop 4½ miles, pub 1 mile and restaurant 1¼ miles from Sherrill Farm Holiday Cottages near Tavistock. Parsley is all on the ground floor. All properties: Electric heating, electricity, bed linen and Wi-Fi included. Towel hire. Travel cot and highchair available on request. Grounds (shared with other guests on-site). Barbecue. Indoor heated swimming pool with shower and changing facilities (shared, 12m x 6m, depth 1.6m, open 8.30am-9pm all year). Hot tub (shared with other guests on-site. All weather tennis court, small gym, games room with table tennis and table football, indoor skittle alley and children’s play area (shared with other guests on-site). Karaoke machine with on screen graphics for hire. Beauty therapist available by arrangement with the owner. Fishing (rods for hire). No smoking. Please note: There are ponds in the grounds. Holidays at Parsley, Sherrill Farm Holiday Cottages run from Friday to Friday. Pets allowed at Sherrill Farm Holiday Cottages - Parsley. For a better idea of where Sherrill Farm Holiday Cottages - Parsley is, you can see Sherrill Farm Holiday Cottages - Parsley on the map below. 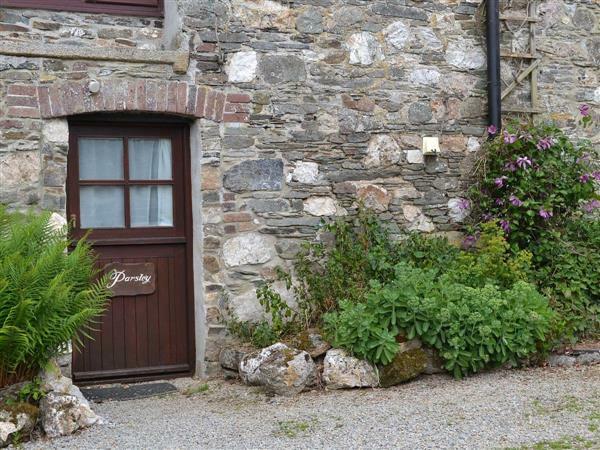 Sherrill Farm Holiday Cottages - Parsley is in Devon; should you be on the lookout for a special offer, you can find all the special offers in Devon. It's always worth checking to see what is on offer at the moment. Do you want to holiday near Sherrill Farm Holiday Cottages - Parsley (UKC1438), you can see other cottages within 25 miles of Sherrill Farm Holiday Cottages - Parsley; have a look to find your perfect holiday location.